Higher retail and independent wholesaler volumes were helped by positive sales trends in the North—West and Black Sea regions. Sales of low-sulphur marine fuels continued to increase as a proportion of Gazpromneft Marine Bunker’s total sales structure, with environmentally friendly fuels (with sulphur content below 0.1 percent) increasing 26 percent year-on-year to reach 200,000 tonnes. 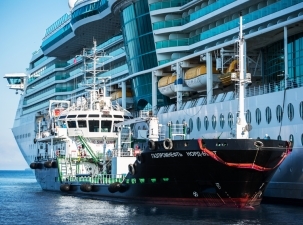 Gazprom Net plans to use liquefied natural gas (LNG) to expand its marine-fuels product range in the medium term — the company having begun introducing international LNG-bunkering standards into Russian shipping in 2018, as well as initiating the construction of Russia’s first LNG bunkering tanker — a project unique to the industry. Gazpromneft Marine Bunker is a subsidiary of Gazprom Neft created in 2007 for providing year-round marine fuel and lubricant supplies for sea and river vessels. The company comprises seven regional representative offices and six subsidiaries and has a presence at all of Russia’s leading sea ports. MARPOL — the “International Convention for the Prevention of Pollution from Ships”. An amendment to the main treaty in early 2015 introduced a further regulation governing the permissible amount of sulphur in marine fuels used in vessels covering Sulphur Emission Control Areas (SECA, covering shipping zones including the Baltic Sea, the North Sea and the English Channel, where vessels are required to switch to low-sulphur fuels).